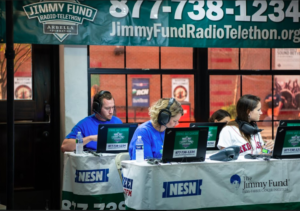 On August 21, 2018, Ace Ticket continued its support for the Jimmy Fund Telethon, donating $5000 to the Dana-Farber Cancer Institute. For the second year in a row, Ace Ticket VP, Adam Clark was on hand to deliver the check and chat with the NESN crew at Fenway.Thanks to generous support from across the country and around the world, more than $4.4 million was raised to support cancer research and patient care at Dana-Farber! Adam along with his fellow ACE Ticket staff members who manned the phones and hit the street during theJimmyFund Telethon on Tuesday, was joined with Dana-Farber patients, doctors, researches, and nurses as well as athletes and local celebrities during two Red Sox games for a 36-hour live broadcast on WEEI Sports Radio Network and New England Sports Network (NESN). 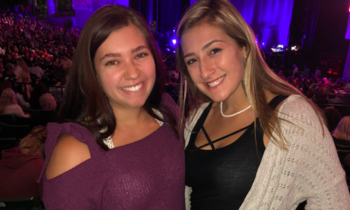 Since its founding in 1948, the Jimmy Fund has supported the fight against cancer in children and adults at Boston’s Dana-Farber Cancer Institute. 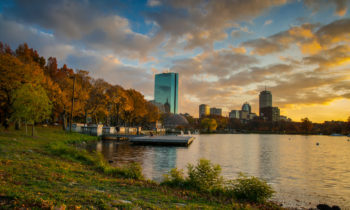 Dana-Farber supports more than 380,000 patient visits a year, is involved in some 700 clinical trials, and is internationally renowned for its blending of research and clinical excellence. 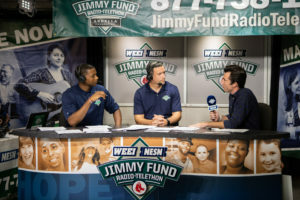 2018 marks the 17th year of the WEEI/NESN Jimmy Fund Radio-Telethon and raises millions of dollars towards the fight against cancer.